As I've previously mentioned, a few months ago I had the pleasure of visiting York. It's a beautiful city, with narrow streets, quirky buildings and a sense of history everywhere you look. It's a place to step back in time, and nowhere is this more apparent than by the Minster. The building towers over its surroundings, catching your eye as you meander through the higgledy-piggledy streets and guiding you to your destination. Which in my case was a bookshop. Now the obvious choice would be the traditional, antiquarian and secondhand bookshop that perfectly matches its historic surroundings. But I didn't hear about that one until after my visit was finished. Instead I had my sights set on contrast. I wanted to see how the modern fit alongside the historic. The relatively new The Little Apple Bookshop was the perfect place to do just that. The bookshop is tiny, it's not the smallest I've ever visited, but the front room especially is not a place for swinging a cat. It's also bright and colourful and perfectly filled with everything you could need to inspire young (and old) minds, with youngsters being particularly lucky with the space allocated to the well-stocked children's section at the back. The thing that stuck with me the most was the sense of fun. Apples sit along the top of bookshelves, cuddly literary characters are everywhere and the mix of books and other stuff is spot on. Wherever you look there's something to admire, pick up, open or investigate, and even the bookshelves offer more than meets the eye as books facing outwards hide other titles by the same author. This last detail was a particular favourite of mine as an invitation to discover extra treats. 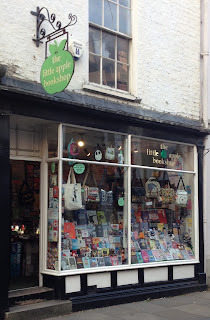 This is a bookshop for everyone, but while I was there a stream of children were passing through and it's impossible to miss the appeal of The Little Apple Bookshop to young people. I love the idea of families visiting the historic landmarks and stumbling across the bookshop as a reward to patient children. Or of local youngsters being drawn in by the colour and fun, discovering a love of reading and continuing to visit as they grow into adulthood. 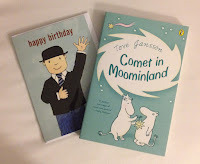 As for me, I took my love of reading and returned to childhood, choosing to buy Tove Jansson's Comet in Moominland. * I've long wanted to read these dark children's books and this bright and fun bookshop in the shadow of the Minster seemed the perfect place to start my collection. The Little Apple Bookshop may not be a dedicated children's bookshop, but to me it's the perfect place to grow young readers. *Yes, I also bought a birthday card. A few months after the visit I need to own up to one of the friends I was visiting York with: Sorry, I forgot your birthday, but at least I still managed to buy you a card before the day itself.